Home Security Camera vs Baby Monitor: Which Should You Get? Although nearly a year old, all of the information in this article is still relevant. It is important to know the differences between security cameras and baby monitors; scroll down to find out how. Many do-it-yourself home security camera systems are now being promoted as options when searching for a quality baby monitor. 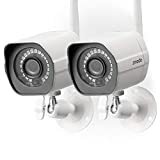 With product review sites insisting that most connected baby monitors are effectively just home security cameras,, it can be downright baffling to determine exactly what you should put into your shopping cart. Here are some tips to help you sort through the mass of networking, camera angles, and recording options available for the new family. While many security cam and nanny cam systems offer apps to operate and access your cameras through a smartphone, not all offer the same level of access. Many baby monitors include two-way audio so that you are able to speak to your child while on the move. Most security systems don’t have any kind of audio recording or two-way capability at all. If you are observing your home or child from the office, you may wish to have the ability to move the camera angle. It is more likely that you will find that kind of adaptability in security systems that are intended to cover larger areas vs. baby monitors that are typically used to keep track of a child in a small area like a playpen or crib. Your baby monitor system might include photo opportunities in the phone app where you can capture a screenshot and share it over your social media when baby is wiggling with a big smile. You will only be able to complete screen captures locally on your standard home security system. Meanwhile, if you only want to keep an eye on your child while you are preparing dinner in the other room, the full-blown home security system would be entirely overkill for that purpose. Your answer to the big question lies in defining your expectations of a camera system. You will simply end up returning it all if you impulsively purchase a baby monitor because it says it is wireless and then hope to record two weeks of images when that is not how the system is designed. Make a list of your needs before browsing the internet or visiting the big box store. If you end up with a salesperson assisting you, that list will help them ensure your complete satisfaction with your purchase. If you have a monitored home security system from a reputable firm like Protect America, you may be able to expand your current capabilities to include baby monitoring with the right equipment. Make an appointment to consult with your local security professional for quotes and recommendations you can trust.